Creole cuisine at the Loews New Orleans Hotel. Breakfast & Lunch Mon.-Fri., Dinner Mon.-Sat., Brunch Sat.-Sun. : Café Adelaide in the Loews New Orleans Hotel is inspired by the late Adelaide Brennan, a storied member of the legendary local Brennan family. Her joie de vivre reportedly took her around the world. This establishment still harbors her spirit in the adjacent Swizzle Stick Bar, renowned for mixing up creative, modern cocktails. 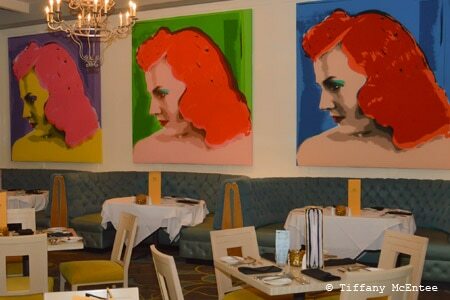 The light, airy dining room has Warhol-inspired portraits of the grande dame herself. Executive chef Meg Bickford exults in blending traditional New Orleans fare (try the proper dark-roux seafood gumbo) and Southern fun with items such as hot sauce and buttermilk crusted chicken livers, served with Alabama peach jam, of course. Did we mention the white truffle cream cheese grits? After a full meal of pork shoulders smothered in milk with whiskey braised escargot, treat yourself to white chocolate biscuit pudding with Abita root beer syrup. Take your time with the wine list --- it is long and global.